Porcelain berry bowl with a red, cranberry and burgundy interior, a light red exterior and matching saucer. It is dishwasher and microwave safe. It holds over a pound of strawberries or a similar size serving of any fruit or vegetable. The bowl has about two dozen holes to drain the water and air dry the contents. Use with the matching plate as a decorative fruit bowl on your counter or table. 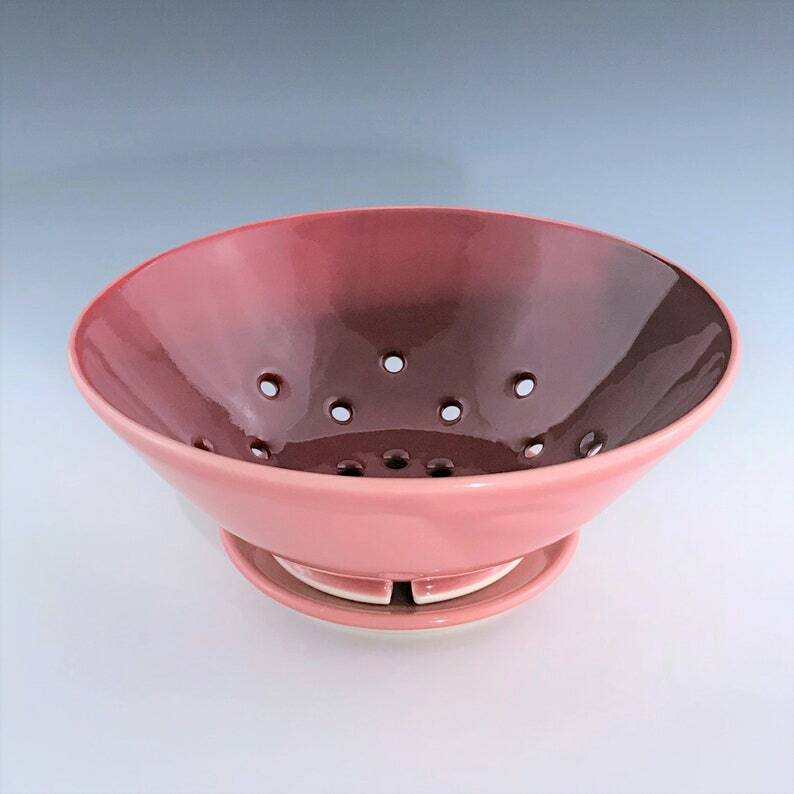 Size: Bowl Height 3" Diameter 8 ¼"; Saucer Height ½", Diameter 5"
Each ceramic berry bowl and saucer are handmade individually and there may be slight variations in size and glaze patterning. I carefully sand and polish the bottom of each piece of pottery so that they are comfortable to the touch and will not scratch any surfaces. I made this berry bowl and plate on a potter's wheel using high-quality porcelain. The striped pattern is hand painted using underglazes. My glazes are mixed from scratch using only non-leaded ingredients. The final glaze firing reaches 2,232°F ensuring that the pot is safe for use with liquids/food and can be used in microwaves and dishwashers.